This site aims to show the history of topiary and to give details and photographs of major topiary gardens in all parts of the United Kingdom such as Levens Hall, Hidcote Manor, Knightshayes, Packwood House and Great Dixter. Once you have been bitten by the topiary bug you probably won’t be able to give it up! Topiary itself has been popular since the days of ancient Rome and, if the tomb paintings of ancient Egypt are to be taken literally, even before. The earliest literary description of topiary (the art of clipping trees and bushes into geometric or whimsical shapes) comes from the Roman Consul Pliny the Elder (AD 62-110) writing about his garden in Tuscany, Italy. It seems that its immediate popularity was ensured as the gardener who first introduced it to the Romans, Cneius Matius, was a close friend of Julius Caesar and the Emperor Augustus. It is more than likely that the Romans introduced topiary into Great Britain and it has had a chequered history ever since. 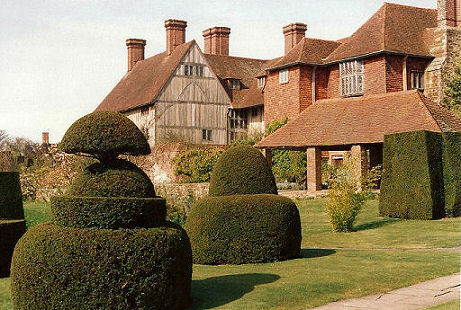 You can find a short history of topiary here. Topiary in the United Kingdom is created by Anthony Blagg, who now lives in Hexham, Northumberland after living for many years in Birmingham and Worcestershire. Have you seen something that has caught your eye? We are always interested to hear of unusual topiary specimens from anywhere in the United Kingdom. Please send us an email, and perhaps a photograph, which could be published on the website. We give listings of topiary gardens in the UK and some gardens have their own page as well with an explanation of what to expect if you visit plus extensive photographs so that you can get a real flavour. New articles and photographs of topiary gardens included recently are Belton House in Lincolnshire, Ickworth in Suffolk, Erddig, Bodysgallen Hall and Bodnant in North Wales and Birkheads Secret Gardens in Tyne and Wear. There are also new photographs for Wightwick Manor near Wolverhampton. If you know the name of a garden but don’t know exactly where it is then try our Full Alphabetical List of Gardens. If you are interested in how to make your own topiary then visit the how to grow page. There are some quick tips and a link to Anthony’s e-book on How to Grow Topiary available on Amazon.Topiary has come into fashion and gone out again on a regular basis throughout history but it will still make a small garden look grand and a grand garden look, …well grander still. We also have a sister topiary site, Topiary Today for gardens outside the UK. Interested in the history of Great Britain? Then visit our other sister site www.britainunlimited.com about the lives of 250 of the Greatest Britons. Why did this site used to be called Frost at Midnight?